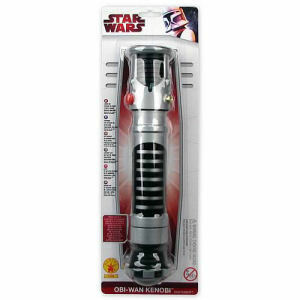 We have Just Sold out of Star Wars Obi-Wan Kenobi Lightsaber. Not to Worry! Fill in the Notify me When Available and you will be the first in line for our restock of Star Wars Obi-Wan Kenobi Lightsaber !! From the Star Wars collection by Rubies. Star Wars Obi-Wan Kenobi Lightsaber. Lightsaber extends to 3-feet in length and lights up! Requires 2 AA batteries that are not included. Ages14 and up.